Just a couple more hours until my birthday! But before that I want to share with you this amazing beauty box by the amazing Lookfantastic.com I was so excited when there sent me over their birthday beauty box edition. It was like receiving an early birthday present. I love the package with the little sprinkle detailing and the gold text. They should design their boxes like this every month. Look Fantastic offer a monthly subscription beauty box service where you receive a bunch of amazing product that are mostly high-end. I really love that each month you don't know what will be in the beauty until you receive it. It's like getting a little surprise each month. The box is no more than £15 per month but it depends on whether you buy a longer subscription, it will then reduce per box per month. This months box is packed with really interesting products that I can't wait to start using. I am really excited for the Caudalie skincare products because I've heard a lot of amazing things about the brand and I can't wait to give them a try. I will be updating you over the next few weeks on how I get on with these products so keep an eye out for that. I'm so glad I came across your blog, you're a total smoke show! 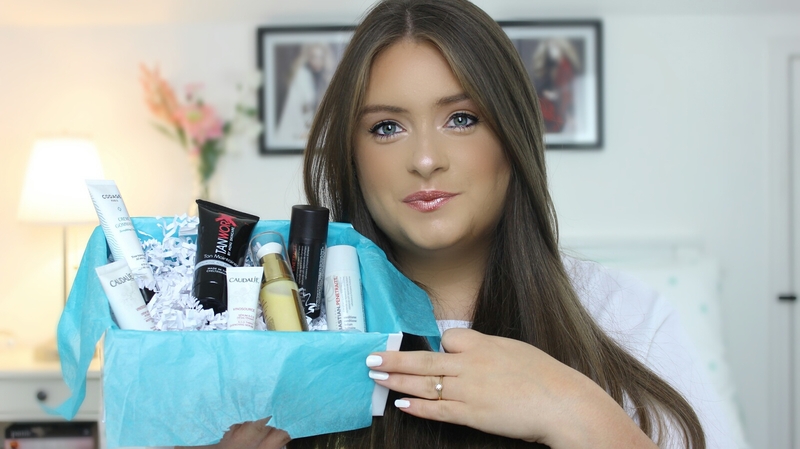 I'm going to have to give this beauty box a try! Kristyn you are so lovely. Thank you!